You have to lift your leg in support of the dog owners of Ocean Beach. These humans dragged their decked out doggies down to Dusty Rhodes park on Sunday to participate in the 4th Annual Kiwanis Dog Carnival. A howling good time was had by all. Despite the large number of dogs in drag and various other costumes, no one got hot under the collar. We did learn that the latest high fashion item for celebrity dogs is a cellphone – a little bluetooth unit imbedded in their neckwear. Yup, now Fifi will have ring around the collar! We probably should mention that some people have a bone to pick with this event because it received a new leash on life with $5K in grant money from the County Supervisor’s slush fund. We stand corrected on this issue, please Melanie Nickel’s comment below. I beg your paw-don, but I am neu-ter this doggie contest business. For me it is a new-found-land, and I find it fetching. And since I do so enjoy kibble-itzing with waggish word hounds, leave your “bad dog” puns in the comments. as a representative of the feline liberation front, i must protest this punny portrayal of puppies. Howl-ever you spell it, yowl have to admit, OBdogs are well-bred and well fed! Good work, Doug, even if your article puts you in the dog house with Frank. Thank you so much for the article and the great pictures about the Ocean Beach Kiwanis Canine Carnival! 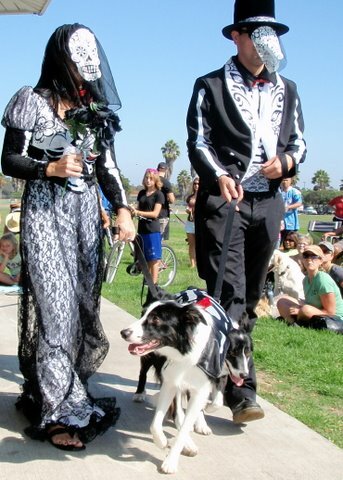 (It’s also co-sponsored by the Ocean Beach Recreation Center and Dog Beach Dog Wash.) It really was a great time with wonderfully creative costumes, and the new location at Dusty Rhodes Park worked out very well. But please make one correction to the information in your article: the event did not receive a county grant for $5,000 or any other amount. The Kiwanis Club of Ocean Beach puts this event on at our own expense and without any public funding. dog-gone-it! sorry ’bout the boo-boo. Melanie – thanks for doing some diggin’ and clarifying this for us. No wonder I got caninefused.